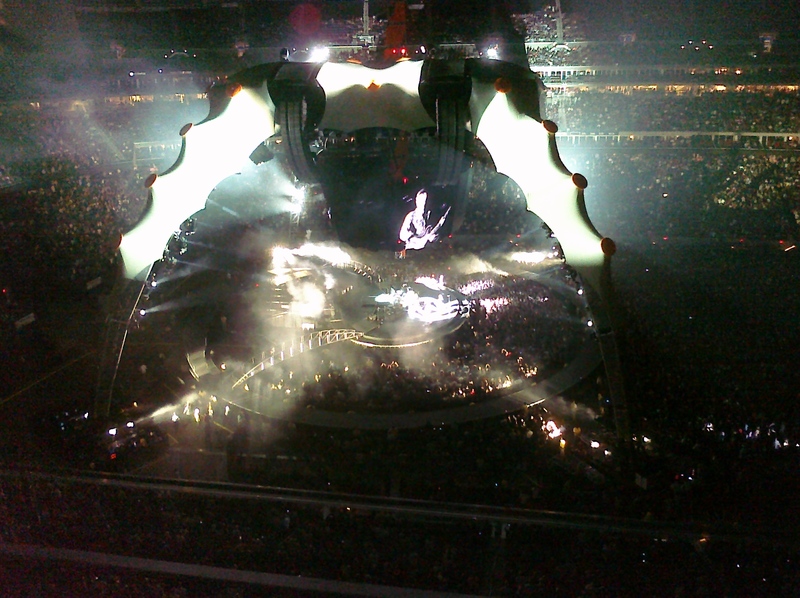 What is there to be said that others haven’t already mentioned about U2’s 360 tour? At this point, it seems like most of my friends and circles have seen and spoken about the tour, but Wednesday was my turn, and I’ve finally had a couple of minutes to sit and relate my experience. First of all, it’s worth pointing out that this was the 4th time I’ve seen U2 in concert, but the first time I’ve seen them in a stadium, as opposed to an arena. While having a concert in a venue as large as Reliant is great in a lot of ways, it does really tone down the energy level quite a bit. I will never forget the moment they walked on stage the first time I saw them in Austin, as the sound of the crowd drowned out the music. While the stadium was larger with an incredible amount of people, it just didn’t have the same energy as previous shows. As usual, the technical side of the show was amazing. The set was over the top, and the video work was some of the best I’ve ever seen. I don’t know who gets to engineer those sets and design them, but if anyone out there happens to read this, I’d be happy to send a resume. While the technical side of things is cool, the reason you go see a band like U2 isn’t their hardware, but the music. To me, there were really three moments in the concert that stood out in particular, and I won’t be taking them in chronological order. One of the great things about U2 in general, in my opinion, is their ability to take their songs and reinterpret them in new, but honest contexts. One of the best examples of that, I think, was their performance of “Sunday Bloody Sunday”, a song written over 25 years ago about an incident where the British Army shot and killed 13 civil rights protesters in 1972. As the band played during this tour, the video screens flashed images primarily of the election troubles in Iran, particularly the scenes of violence, where the chilling refrain, “How long, how long must we sing this song?”, seemed to echo more of despair than U2’s generally upbeat and hopeful take on the future being “a better place“. Mark Love’s comments on the first encore are really better than anything I could say, but none the less the moment was powerful. As a brief recount, the first encore began with a video of Desmond Tutu, then led into “One”, which has been a staple of U2 encores for as long as I’ve seen them. At the end, however, Bono moved smoothly into a single verse of “Amazing Grace”, which was marvelous on many levels. First, it’s perhaps a bit surprising to hear such a classic gospel song at a secular rock concert, but for me it wasn’t just the song – it was the feeling and honesty of Bono’s voice, particularly as he (and most of the crowd) sang the first two lines: “Amazing grace how sweet the sound/ that saved a wretch like me!” To me, it dovetailed perfectly with Bono’s added emphasis during “City of Blinding Lights”: “Blessings not just for the ones who kneel – luckily.” I think there is a wonderful and implicit recognition in the music of U2 that “there but for the grace of God go I”, and that God’s blessings are not the possession of the church, but rather of God, and his to do with as he sees fit. As I mentioned before, in many ways it seemed to me this was a more reflective, less hopeful concert than previous times I’ve seen them. Even though the Vertigo tour’s closing “40” shares a common refrain with “Sunday Bloody Sunday”, the tone of the songs could not be more different – while “40” boldly declares the words of Psalm 40 (“I waited patiently for the Lord / He inclined and heard my cry”), “Sunday Bloody Sunday” takes a much more cynical view of progress: “And the battle’s yet begun / this many lost but tell me who has won?” In the middle of this time of reflection, however, was the bold and beautiful pronouncement of belief following one the two most profoundly (and self-described) gospel songs in their canon – that though we walk in the valley of the shadow of death, we shall fear no evil.